Definition: Bullous myringitis is a viral infection of the external auditory canal, in which fluid-filled blisters form on the eardrum, usually occurs after influenza. Causes of Bullous myringitis are mostly viral, but it is also caused by the same bacterial species that cause other ear infections. What are the symptoms of bullous myringitis? 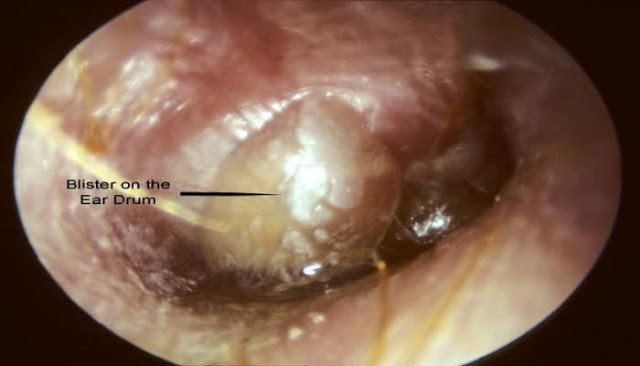 Sudden severe ear pain (otalgia) that lasts for 24-48 hours. Serous bloody ear discharge: it occurs if blisters rupture. In children: irritability and pulling the ear. Upper respiratory tract infection e.g Flu, common cold, etc. as those infection may obstruct the Eustachian tube, so the fluids from resp. infection go to the ear and cause myringitis. What are the possible complications of Bullous myringitis? Hearing loss (transient if properly treated). Spread to the bone which occurs if there is inadequate treatment, leading to deafness, myringitis up to sepsis. If pain resists analgesics, an E.N.T specialist may open the blisters.